Previously, there were a blog entries about "Best Drama TV series in Malaysia ". One of them was Ariana Rose. Due to many best and worth watching Malay drama coming out after that, this lead author do a similar content. Not to be confused this is a Part 2 for label " Drama TV series " in Malaysia. All of the drama series below were introduced second half of the year 2014. They probably out in the month of May - September. If you eager to know which drama rank no 1 in the month of January - April please find the link below in this blog too. 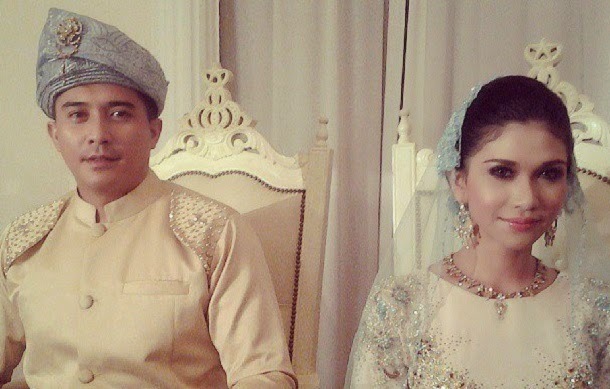 Zill Faezrul Iqba wanted to marry with Armel (Ayda Jebat) as fulfilling his parent wish. He dislike to marry her at the first due to reason he could not forget his girlfriend who passed away 5 years ago. Armel decided to marry him. The story of this TV series is about will their marriage last ? The life of Indah Halina changed completely without direction till fate brought Indah to Dato Sofiya. She works for Dato Sofiya as a personal assistance. Her life get better when Dato Sofiya sons falling in love with Indah. Her beauty captured Dato Sofiya's elder son and second son. The struggle she has to face in coming days due to conflict interest so many peoples. Starring : Shah Jaszle, Amyra Rosli, Elly Mazlein, Ryzal Jaafar. Watch this on TV3 every Wednesday & Thursday. Maya successfully shortlisted for her interview in a company. She is holding a position as assistance manager in creative. The elder son of Dato Efendi, falling in love in a first sight seeing Maya at his father office. Tasya and Amy are best friends when they are still studying at a same school. Both of them chose to have friends with mat rempit. They did have a good life as a young adults. This drama has begun aired on August 2014. Azia parent owned a resort and their parent hoping Azia will inherit the resort. Azia slowly get affected business and her relationship with Zaquan. In the meantime, Umar is giving Azia a sign that he wish to have her as lover. It suppose to be a triangle love drama . Starring : Jericho Rosales, Aaron Aziz, Tiz Zaqyah, Bella Dally, Miera Liyana. This drama is watchable on Astro Mustika channel no 134. Every Monday till Wednesday on 10PM. This drama started on May 2014. This drama is pretty much two popular actors having a love crash on a pretty girl. It an impressive and intense drama due to it has a lot of good visual backgrounds. It must be filming at different locations not only in Malaysia. Who will be the lucky man chosen by Tiz ? This drama is watchable on TV Alhijrah channel no 114. Every Tuesday on 10PM. This drama started on May, 2014. A young married family being tested by trials of life all the people must go through. Their marriage has been set by both parents at a young age. This drama is watchable on TV3 . Every Wednesday and Thursday on 9PM. This drama started on May, 2014 . This drama set on the past of 80-an, Adam and Salmah are love couple Adam is slightly order than Salmah. Their love never faded as the time passed. Their love have been tested by the time. One day, Salmah's memory is gradually erased due to her health condition. Everyday Adam will tell story about them in order to refresh Salmah mind. Will one day Salmah forget Adam and herself eventually ? This drama is watchable on TV3. Every Monday and Thursday on 7PM. This drama started on September, 2014 . Luqman (Fahrin Ahmad) is a graduate from oversea, working private officer or bodyguard for Melina (Sara Ali). Both of them will not have a happy life because life trials happen at least expected. There is a pretty girl Sarah (Ika Nabila) likes Luqman. Melina born in a wealthy family. One day Melina father Datuk Zakri passed away leaving a family will that demand Luqman marrying Melina. Luqman is having a difficulty in choosing Melina and Sarah. This drama is watchable on TV3. Every Wednesday and Thursday on 9PM. This drama started on September, 2014 . The story is about Hana (Fasha Sandha) having a good and peace life with her husband Zulkifli (Aiman Hakim) . Their parent is blessed with two children. Zul is the one supporting the family in term of financial support. However, the existence of third person in their relationship, Masmira makes their relationship is in brick of collapse. But, Masmira wanted to fully owned Zul despise Hana presence.